Support Climate Activism in Boston Neighborhoods in 2014! Ring in the New Year with a pledge for climate justice! 2014 brings a new Mayor to Boston for the first time in 20 years, and BostonCAN is in the perfect place to make sure that Mayor-Elect Marty Walsh implements the strong climate change action ideas he and other candidates promoted during the campaign. Please join us in this important work with your donation and, if possible, with your time! While climate change news grows ever scarier, BostonCAN remains dedicated to fighting paralysis by engaging our network on multiple fronts: working both in the neighborhoods and citywide, on mitigation as well as adaptation, and by connecting Boston residents to statewide and national campaigns. There’s no other group like us, and your support is crucial to preventing climate change from turning our neighborhoods into separate islands of the vulnerable and the protected. 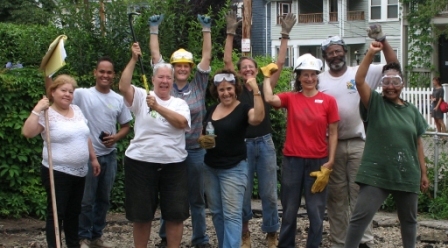 In 2013, BostonCAN convened a new coalition of six Boston neighborhoods making climate change a key issue in the city’s hotly contested mayoral race, helped win passage of a precedent-setting City energy reporting ordinance, joined a new campaign to fix leaky gas pipelines, and organized hands-on events like the De-Paving Party pictured here. Amazingly, we accomplished all this with part-time staff whom we had to lay off in mid-year when our funding ran out. Committed volunteers made our efforts in 2013 a success and they will keep working tirelessly next year, but we can accomplish much more in 2014 if we have enough financial support to hire a new coordinator. Please donate generously to BostonCAN. We will put your dollars to work for what money can’t buy: climate-resilient neighborhoods and a regional ecosystem that can sustain our families now and for future generations. You can make a donation today through our tax-deductible on-line option (just choose Boston Climate Action Network from the program designation menu on this Massachusetts Climate Action Network site) or send a check to BostonCAN, PO Box 300984, Boston, MA 02130. Thanks so much for your generosity and dedication. PS: To ensure a sustainable campaign for climate justice in Boston, we are aiming to raise $5,000 by January 15th. A gift of even $30 would cover the cost of a hall for a movie night, $100 would support the design, translation, and printing of handouts for our summer fair tabling, while $500 would underwrite almost a whole week of our lean organizing machine. PPS: Click here for more photos of BostonCAN events. Previous Article Join us for a Gas Leak Safari! Next Article Leaking Natual Gas Pipes: Dangerous and Costly!